Here’s the list of exhibitors for our Day for Science science fair! We are thankful to have so many wonderful organizations and groups ready to engage in outreach to our community. and local student science fair competitors. Our little march made it into SCIENCE! We are just one little section in a long piece, but are happy to be included! The article gives a broad look at ‘where we’ve come from/what’s next’ for this science advocacy movement. 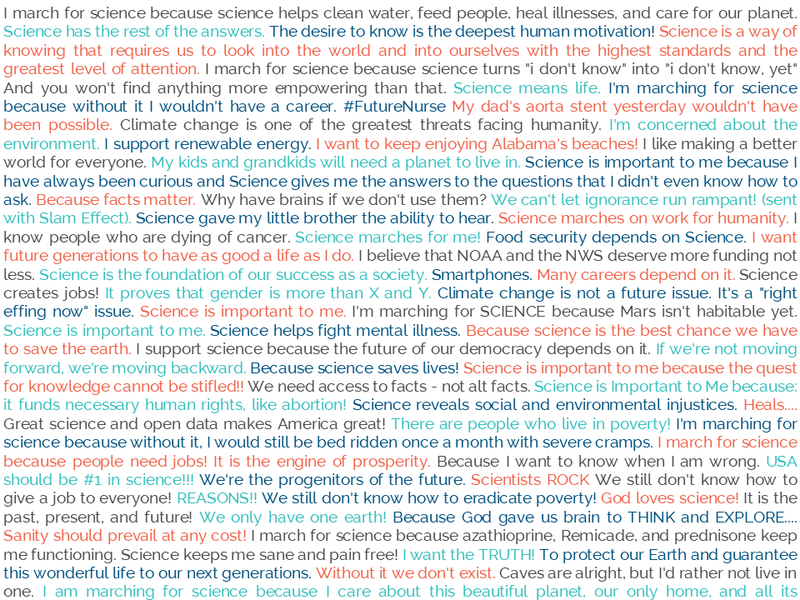 Participants in last year’s March for Science in Mobile may remember our interactive booth, where you could text your answer to the question “Science is important to me because…” and have it displayed at the event along with all the other answers. We’ve compiled a selection of the responses into a graphic. How do YOU answer this question? Help us reach our $200 goal! Today we’re launching a fundraising campaign at Kind.Fund to help pay the cost of the traffic safety officers we need to close the streets in order for our march to take place. Right now on the day of the national March for Science event, March for Science Mobile is the ONLY registered satellite in Alabama and for hundreds of miles along the Gulf coast. Help show the world that science advocacy is important to the people in our region! Still Time to Get Shirts Before Event Day! NEW by request: Classic V-Neck shirts. 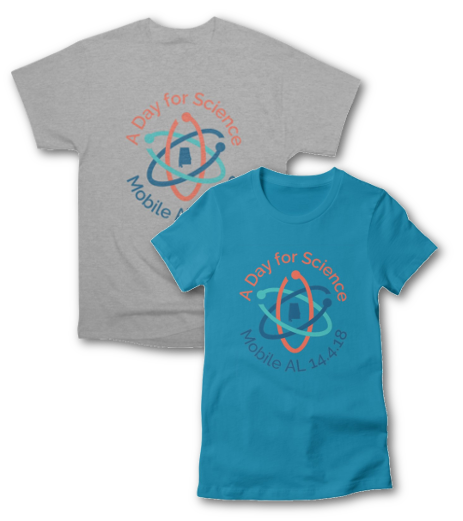 Visit our artist shop on Threadless to get your March for Science Mobile merchandise before event day! Threadless is a print-on-demand service, so your items are made and then shipped after you place your order – no waiting for a campaign to end. Keep in mind that a couple of days are need for printing, and then you’ll need to add shipping time. Orders of $45 or more will receive FREE SHIPPING (Use Code “SCIENCEMARCH181f16ad”) – so go in with a friend or order for the whole family! Check size charts before ordering – women’s fit shirts in particular run small! This year we have kids’ sizes AND onesies, too. All sales support A Day for Science 2018.